The temptation to overcomplicate chicken soup is understandable, since it often suffers from watery, flavorless broth. To fix that, we build soups with balanced acidity and spice. Our Georgian Chicken Soup uses black peppercorns and red pepper flakes to provide heat, while egg yolks and fresh herbs provide rich body and brightness. 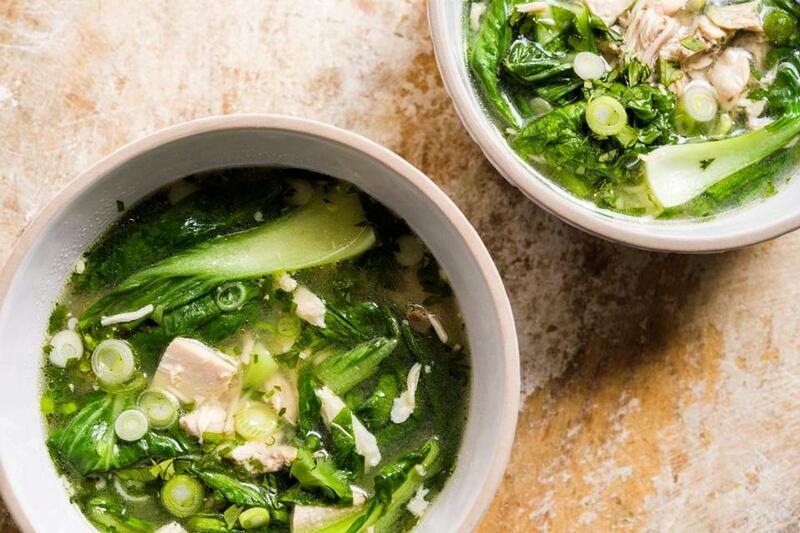 In our Ginger Chicken and Bok Choy Soup, bold Cantonese seasonings accent the mild meat. Last, we use jalapeños in our Mexican Chicken Soup to keep the heat reasonable, but if it suits you, crank it up with serrano peppers instead. Simmering whole spices and fresh herbs in the broth imparted more flavor than the usual method of seasoning and thickening soups (sautéing ground spices in a roux). We liked the hint of heat from red pepper flakes, but they can be left out for a milder version. Browning the carrots and onions before making the roux developed a subtle sweetness and depth that paired well with the tangy soup. Don’t substitute white chicken meat; bone-in dark meat is better suited to this recipe. The skin, bones, and collagen add flavor and body to the broth, and the dark meat is less apt to dry out. To make the broth, tie the stems of the cilantro and dill into bundles, then trim off the leaves. Chop and reserve ¼ cup of each for garnish. Cut off and discard the top third of the garlic head, leaving the head intact. In a large pot, combine 10 cups of water, both sets of stems, the garlic, chicken legs, and remaining broth ingredients. Bring to a boil, then reduce heat to medium-low and simmer for 45 minutes. Remove and set aside the garlic head. Transfer the chicken to a plate and cool until it can be easily handled. Shred the chicken meat into bite-size pieces, discarding the skin, bones, and cartilage. Set aside. To make the soup, strain the broth into another pot or bowl, discarding the solids. Using tongs, squeeze the garlic head into the broth — the tender cloves should easily pop out of their skins — and whisk into the broth. Wipe out the empty pot, and then add the carrots, onion, butter, and ½ teaspoon salt. Set over medium-high and cook, stirring occasionally, until the onion is browned, 10 to 12 minutes. Add the vermouth, scraping up any browned bits, and cook until evaporated, 1 to 2 minutes. Add the flour and cook, stirring constantly, for 1 minute. Add 2 cups of the broth and stir until smooth, then add the remaining broth and bring to a simmer. In a medium bowl, whisk the egg yolks. Continue whisking while slowly adding 1 cup of hot broth from the pot. Whisk in the lemon juice, then return the mixture to the pot and whisk to combine. Add the chicken and any accumulated juices and cook until just heated through (do not simmer). Taste and season with salt and pepper. Serve with reserved chopped cilantro and dill. Ginger Chicken and Bok Choy Soup. This light, simple soup relies on classic Cantonese seasonings of ginger, garlic, and scallions for an aromatic counterpoint to the mild and smooth chicken. It can be served as is or made heartier with last-minute stir-ins such as steamed white rice, cooked noodles, or cubes of tofu. Also try it garnished with chili oil or toasted sesame oil. If you happen to have the Chinese rice wine known as Shaoxing, use it in place of the dry sherry. Don’t use boneless, skinless chicken thighs. 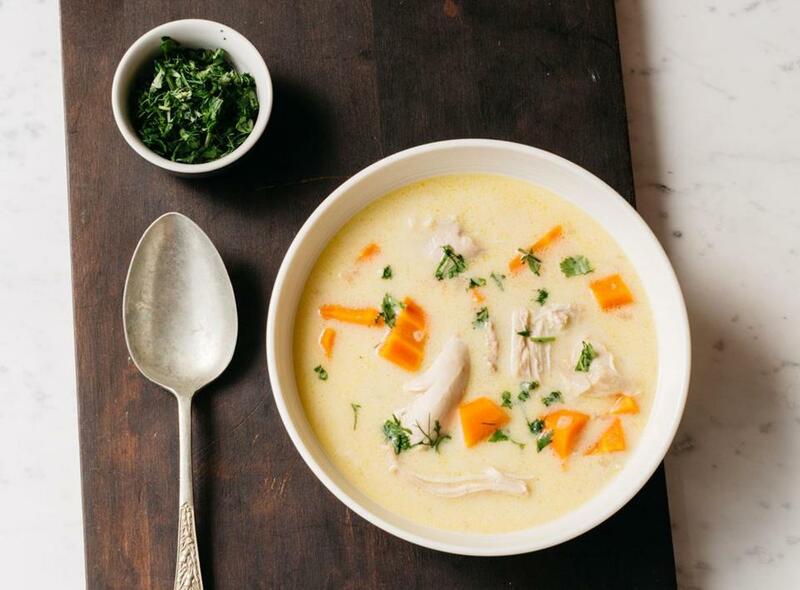 The soup gets richer chicken flavor from bone-in, skin-on thighs. And don’t use cooking sherry; it’s too salty. In a large pot over medium-high, heat the oil until shimmering. Add the ginger and garlic, then cook, stirring, until fragrant, about 30 seconds. Add the sherry and simmer until slightly reduced, about 1 minute. Add 6 cups water, 2½ teaspoons salt, and ½ teaspoon white pepper and bring to a simmer. Add the chicken and return to a simmer. Cover and cook, adjusting the heat to maintain a gentle simmer, until the chicken is cooked through, 35 to 45 minutes. Remove the pot from the heat. Transfer the chicken to a plate and let it cool slightly. Remove and discard the skin, then use two forks to shred the meat into bite-size pieces; discard the bones. Return the broth to a simmer over medium-high. Stir in the bok choy and cook until tender, about 3 minutes. Stir in the shredded chicken and any accumulated juices. Off heat, stir in the scallions, cilantro, and vinegar. Taste and season with salt and white pepper. The soup’s heat hinges on the jalapeños; for more heat, use serrano peppers or include the chilies’ seeds. If you can’t find fresh tomatillos, you can substitute a can of tomatillos or diced tomatoes, drained. The broth and chicken can be made a day ahead and refrigerated separately before proceeding. However, shred the chicken while it’s still warm. We liked garnishing the soup with chopped avocado, sliced jalapeños, crumbled queso fresco, and fried tortilla strips. In a large pot, combine 6 cups water, the chicken broth, quartered onion, cilantro stems, dried chilies, cumin seeds, coriander seeds, and 1 teaspoon salt. Cut off and discard the top third of the garlic head, leaving the cloves intact, and add to the pot. Cover and bring to a boil, then simmer for 10 minutes. Add the chicken and return to a boil. Reduce the heat to medium-low and cook partially covered for 30 minutes, maintaining a gentle simmer. Meanwhile, heat the broiler to high with an oven rack 6 inches from the element. Arrange the poblanos and jalapeños on a rimmed baking sheet and broil, turning frequently, until evenly blackened and blistered, 10 to 12 minutes. Transfer to a bowl, cover tightly, and set aside. Chop the cilantro leaves and set aside. Peel, stem, and seed the blackened fresh chilies, then roughly chop and add to a food processor along with the tomatillos. Pulse until coarsely chopped, six to eight pulses. Transfer the chicken and garlic head to a plate and let cool. Strain the broth, discarding the solids. Wipe out the pot. Add the oil, chopped onion, and ½ teaspoon salt. Cook over medium-high, stirring occasionally, until softened and beginning to brown, 7 to 9 minutes. Add the ground cumin, ground coriander, and oregano and cook, stirring constantly, for 1 minute. Add the tomatillo-chili mixture and cook, stirring frequently and scraping up any browned bits, until most of the moisture has evaporated, about 5 minutes. Add the broth and bring to a boil. Shred the chicken into bite-size pieces, discarding the skin, bones, and cartilage. Using tongs, squeeze the garlic head into the soup. Add the chicken and hominy. Return to a simmer and cook until heated through, about 5 minutes. Stir in ½ cup of the chopped cilantro, then taste and season with salt, if necessary. Top the soup with toasted pepitas, lime juice, more chopped cilantro, and sour cream, if desired.